Late on Monday night it started to snow, it was eerie how light it appeared to be, as though it was still twilight. 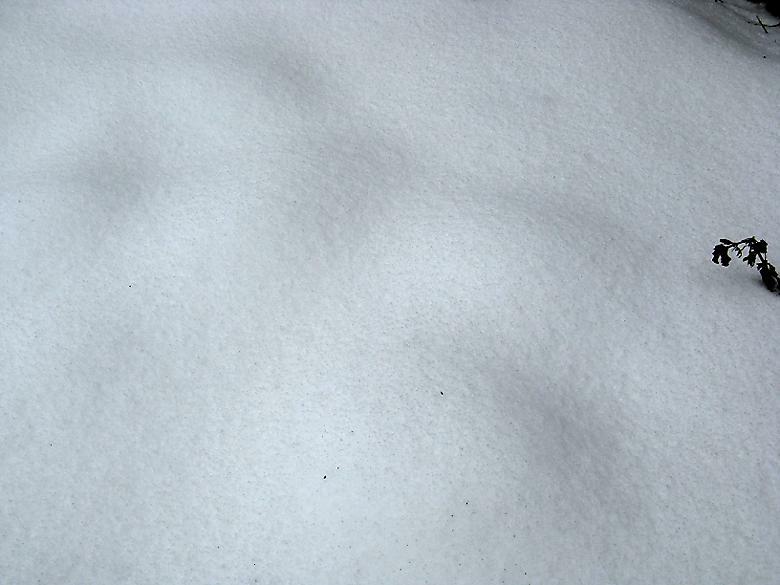 The snow peaked on Thursday when it was a complete cover of 10-13cm across the garden. Today it has settled and there are signs of it starting to melt. 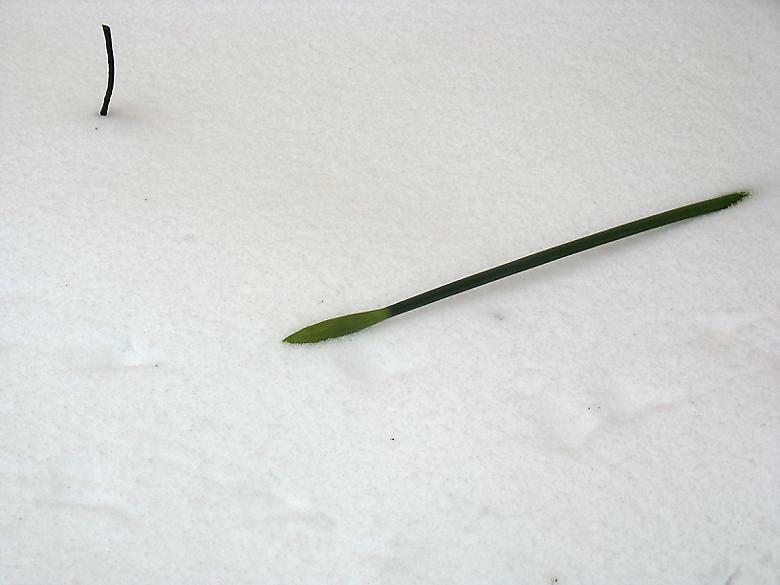 However almost all the flowers are still buried, including all the snowdrops. So it will have to be six things covered in snow this Saturday. I get to pretend that there is something wonderful beneath the snow and you can pretend to be impressed (optional). 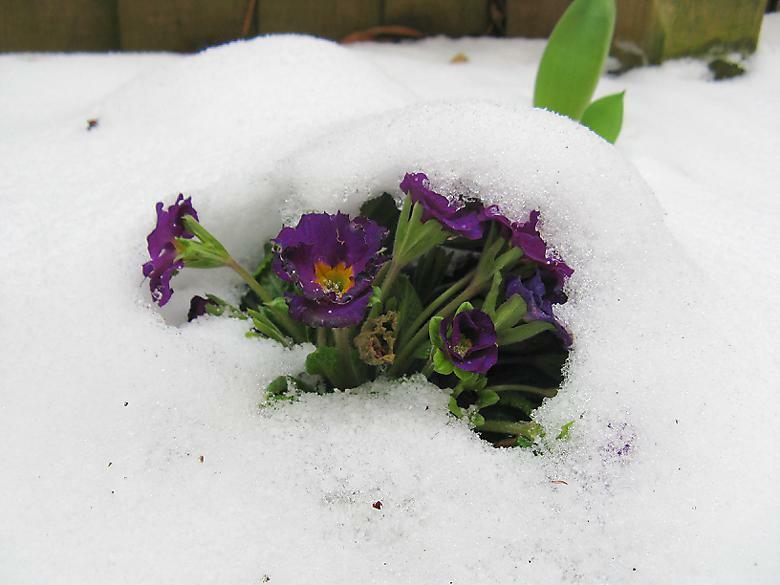 There is a bit less snow down the side of the house and this primrose is now partially visible. These ones are still covered and you can just make out where they are. Also covered, there is a line of stones between the soil and the gravel. Its been annoying me for a while as soil has been washed between the stones onto the gravel area. Last weekend I finally moved the stones, scooped up the gravel and washed it out in a bucket before replacing the stones and pouring back the washed gravel. It looked so much better. It is far too early to know if anything has been killed off by this cold spell. It has not really been any colder than during previous cold spells, but it may make a difference that plants were starting to grow. This is Salvia 'hot lips' and it is looking a little the worse for wear. The leaves were already starting to thin out a little before the cold hit however. It is supposed to pretty hardy, so I am expecting it to survive, fingers crossed. My S 'Radio red' is looking similar, I am expecting it to survive too, though with less certainty. I didn't take a picture of my Cordyline but the leaves are looking a bit less green than usual and many of them have been pushed down by the snow. Will need to keep an eye on it. It seems that the trunk can be damaged by frost and start to rot, but the plant is likely to put up new shoots if that is the case. The resident blackbird wasn't able to do its usual trick of digging up the borders and was forced to eat the bird food hanging above. Poor thing. There must still have been something on the surface to eat as he still spent a bit of time searching across this area, as you can see from the tracks. 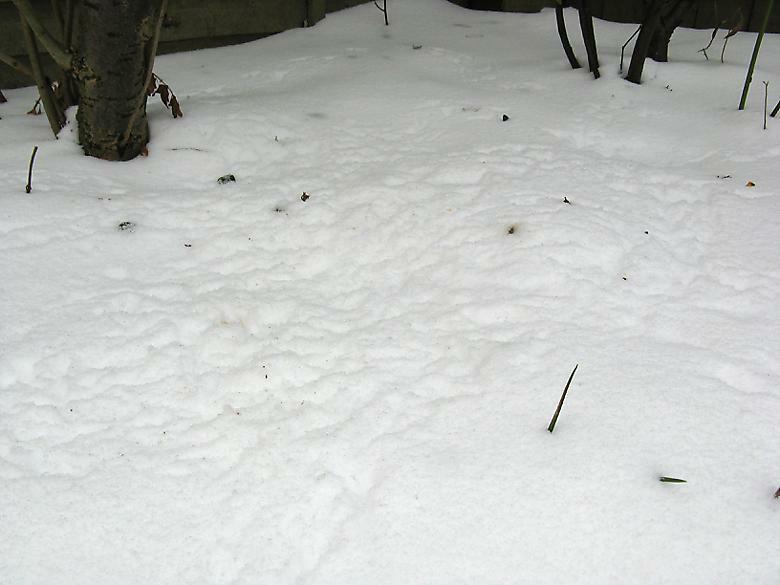 The snowdrops, winter aconite and crocuses are completely buried here. Last weekend I removed all the self seeded cotoneasters toward the back right of this area. This revealed something that I don't recognise (the rightmost two thin stems at the top, hardly visible). 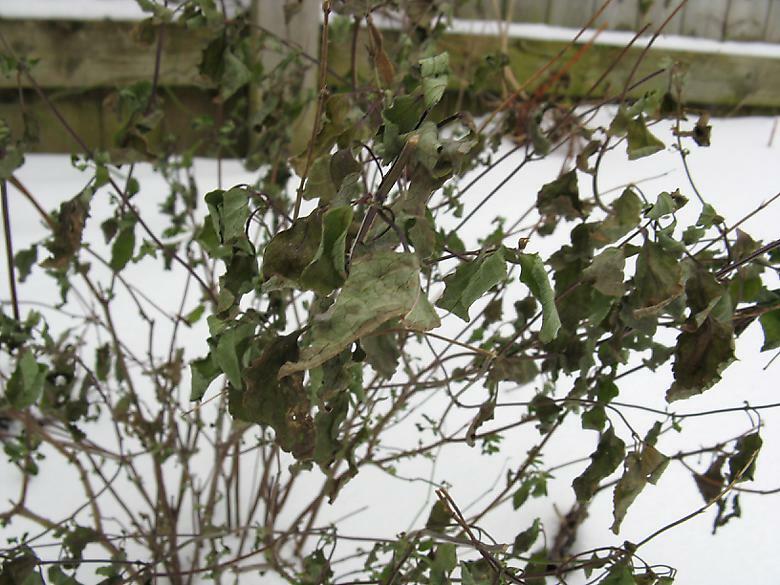 It has two green stems about a meter and a half, with no leaves. I've no idea what it is, but the thing it most resembles at the moment is the Kerria japonica. Anyway I've left it in to see what it turns out to be. This is/(was?) my most advanced daffodil bud. It has completely keeled over. I have many plants waiting to be planted. I decided to move them into the garage during the coldest weather. 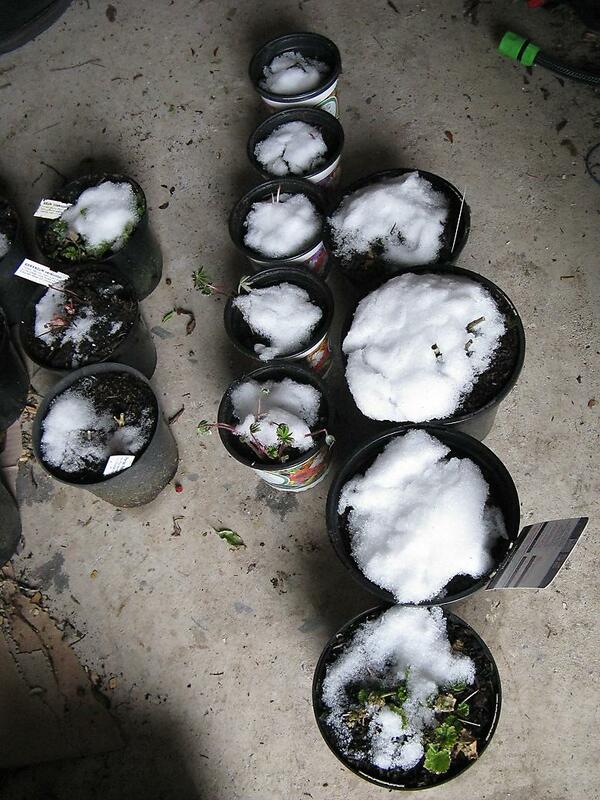 They have been there since Tuesday and are still covered in snow with the compost being frozen solid. I'll leave them there until they thaw, probably in the next day or so.